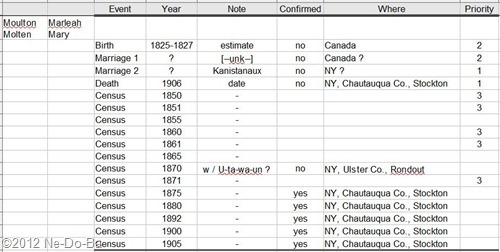 Today I will provide my first general review of the data collected for Marleah / Mary (Moulton) Kanistanaux. I need to assess what is known and what is missing for this family member. This will assist me in planning my next phase of research. I have no confirmed vital records for Marleah, so I need to concentrate on locating those. The death record should be in Stockton and this is where I need to start. I suspect Marleah and Laton were married sometime after the end of the Civil War and certainly before they appear in Stockton in 1875. If I am real lucky, they were married in Stockton. If not, well, I really have no idea where to look for a marriage record. Finding Marleah and/or Laton in the 1870 census would help a great deal in determining when and where they might have been married. I think Marleah is with U-ta-wa-un in 1870, but it would be nice to be certain. Of course there is always the possibility she actually was married to U-ta-wa-un in 1870 and divorced him between then and 1875. If so, she continued to travel with him as his “sister” off and on after the divorce. As I said, possible, but it doesn’t seem likely. However, if there was a marriage, that means he could be the father of some or all of the kids. Oh my, I’m getting dizzy again! Marleah probably did have at least one prior husband, but without a surname, I have no idea how to find her marriage record. Perhaps records of the children will provide some clues as to where they were born and who their real father was. This would certainly help me learn more about Marleah – if they are her children. This chart demonstrates, based on age at birth, that Marleah could be the mother of all these children including the elder Dr. Lee-o-netto. Finding more data for these potential children needs to be a priority. Marleah’s birth place is consistently reported in her census records as Canada and in one year Canada East is specified. Canada East usually refers to Quebec Province. I used the second column of the above chart to record the race or color found in each census record for Marleah. As you can see, see was recorded as non-white in all but one census. I see no reason to doubt she was a Native American. Her presumed children are less consistent, with two of them claiming English Canada (Ontario) at least once as the birth location of their mother. Lee-o-netto (documented sibling to Carrie & Henry) claims her mother was born in New York, but she also claims NY as her own birth place. Poor William is really confused, with different places given in each census. To be fair, I don’t really know if it is William providing this information to the census taker. The children are even less consistent about the birth location of their father. Carrie thinks he is from the west, Henry says Canada, Lee-o-netto says NY and once again William can’t make up his mind. This doesn’t really help me determine anything about Marleah’s likely prior marriage. I will have to gather more data from the kids before I can get serious about finding her prior marriage(s). William’s response in 1920 is quite interesting. That year he claimed his father was born in Michigan and his mother in France! Her mother tongue is given as French in this census. It is possible there was some miscommunication between William and the census taker. He may have been trying to infer she was from French Canada. This is the first time I have encountered anything to suggest Marleah spoke French. This may be a good clue to her origins. That is, of course, if Marleah is his mother!